The Inov-8 Roclite 295’s – Back in Black! 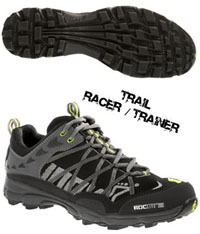 Framed in black with Inov-8’s high visibility accent, these shoes rock. Integrated in this shoe, like all Inov-8’s, is their patent pending Fascia Band which replicates the plantar fascia ligament to increase propulsion efficiency and reduce fatigue. The Roclite 295, designed with Inov-8’s exclusive sticky rubber compound on the outsole for grip in wet conditions and an upper with great breathability, will keep you rolling along those trails. Check out this race report from Inov-8 athlete Mark Lundblad. « Pete Travels to Kentucky w/ his new Kelty Mistral 0° Sleeping Bag!